Starting her Real Estate career in 2013 as a Receptionist and advancing to Property Manager & becoming a Licensed Real Estate Agent, Jodie’s enthusiastic, modern and unique approach to Property Management is second to none. Having grown up in the Great Lakes, Jodie’s knowledge of the area, and its community, puts her in good stead to not only look after her clients on a personal level, but gives her the upper hand in understanding and identifying with people and why they want to live in our beautiful area. 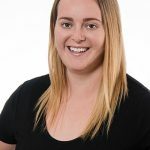 Loving the buzz of a varied day, Jodie relishes working with all the different owners and tenants alike and the challenging situations that can arise.